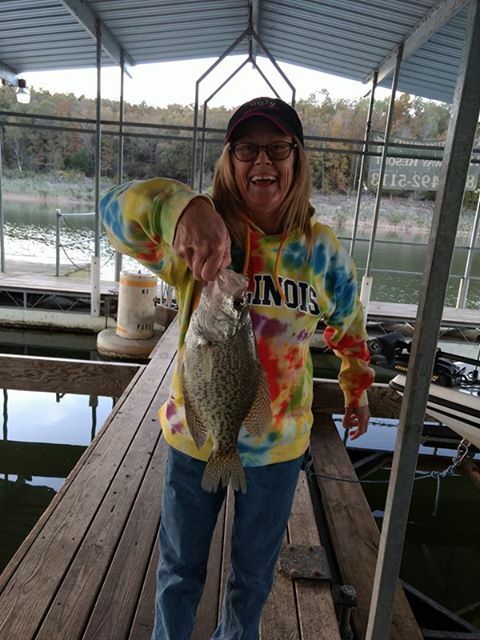 Norfork Lake is in its fall fishing pattern and the fish are starting to go deeper as the water temperature cools. One of the most exciting things about fishing in the fall is that the fish are on the feed and you can get into monster schools of feeding fish. Hopefully we will also see some topwater feeding going on this fall, but that does not necessarily happen every fall. 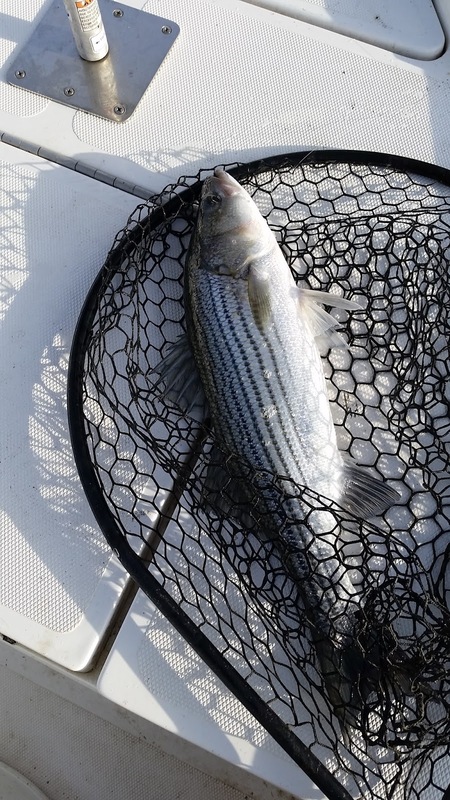 Striped bass fishing is starting to show great signs that the cooler water temperature has schooled them up and they are starting their feeding frenzy for the upcoming winter cold months. I have scouted a lot of different fishing areas of Norfork Lake and have found that many shad have been moving back into the creeks. The last 2 days I have found large schools of striped bass and hybrid bass feeding in 30 - 50 feet of water. The hybrids that I have found are schooled and typically suspended 10 - 20 feet down and when I get into striped bass they have typically been deeper. I have been vertical jigging a 3/4 ounce white and green spoon and have also been using a couple of down poles with live bait.. Today I ran into a school of fish in 47 feet of water and all my live bait poles got buried at once and I also hooked into a good fish on my spoon. After about a 5 minute fight the fish on the spoon unhooked, then I went to the live bait rods and landed 2 fish from the 3 rods I had set out. Not bad. hahaha It was hectic. Creeks you should check out are Fall, Panther, Float and back in the Bennetts area. If you find a lot of bait there will more than likely be fish close by. Heading up river check out the flats in the Briar Creek area and up into Missouri. There are a lot of whites, stripers and hybrids from the Calamity and Barren Creek area to just south of point 10 and up to Cane Creek. 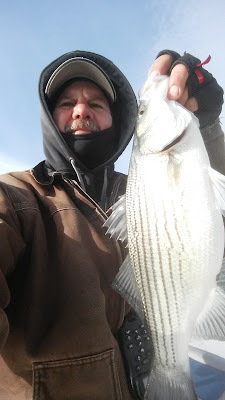 Don't be afraid to get inside the coves in shallow water 16 feet or so, there have been stripers jigged up in the shallower water. 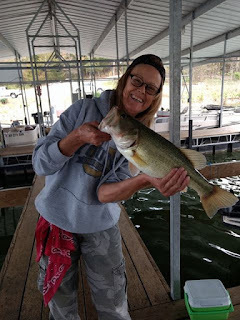 Largemouth bass fishing is also picking up. I am still finding schools of feeding fish in 30 - 40 feet of water on large flats. When you get lucky enough to find these schools you have the chance of picking up many 3 - 4 pound fish in a big hurry. 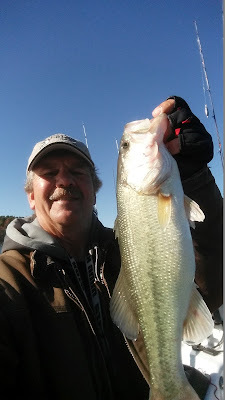 I have been jigging a spoon, but casting out a Texas rigged worm or jig & pig will catch you some nice fish. 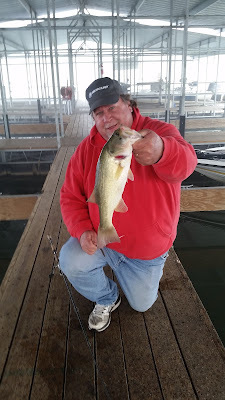 The bass have started to move to shallower water early and late in the day. Look to the deep bluff lines and get down to 10 - 20 feet and you will find some feeding fish. Along with the largemouth will be smallmouth bass. Crank baits are working in some areas and as always, back in the Bennetts area is a great place to work crank baits in the shallower water. Crappie fishing is still good and they have also started to go deeper. The other day I was fishing a 40 foot deep older brush pile that had timber lying on the bottom. The crappie were right on the bottom next to the timber. 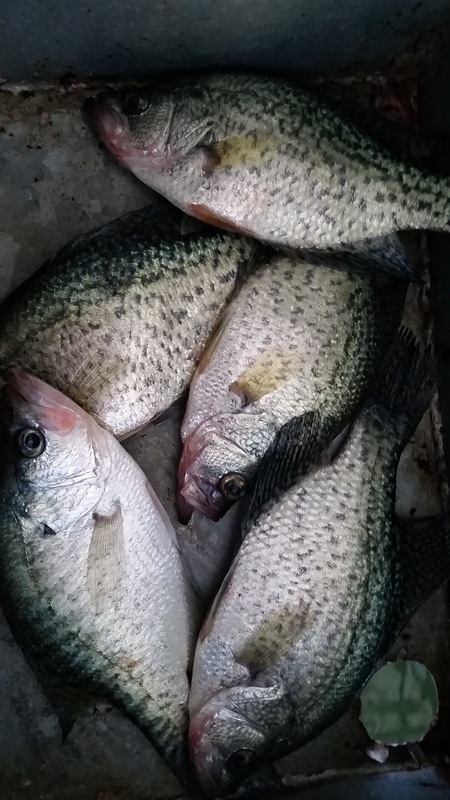 When you do fish brush piles for crappie they will typically be at the top of the brush, but if you can get down deeper inside of the brush you are more likely to pick up the bigger slabs. As normal, late in the day the crappie move up in the water column over the brush and may be 6 - 8 feet down. I guess you can tell by the above you need to check out all depths until you find the one that is most productive. 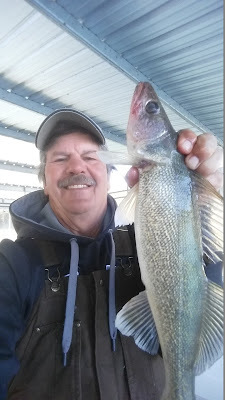 I am still picking up walleye on the flats in 30 - 40 feet of water. As with the other species, I am catching them on a spoon jigging it off the bottom. Crawler harnesses with a bottom bouncer are also working well. Norfork Lake level is falling ever so slightly and currently sits at 553.07. The surface water temperature this morning was 65 degrees and typically will rise a degree or two as the day wears on. The creeks and coves are stained and the main lake is a little off color, but overall the water clarity is a great fishing color. It does appear the lake is turning over and I believe it should be very close to completion. 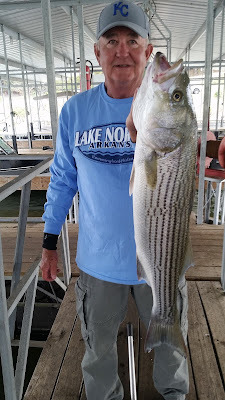 I received an oxygen report from our Striper Club on the 20th of October and the good oxygenated water had dropped to 50 - 55 feet and at that time the water temp down to 55 ft was 72 degrees. The water has cooled drastically since that time adding in the turnover process.